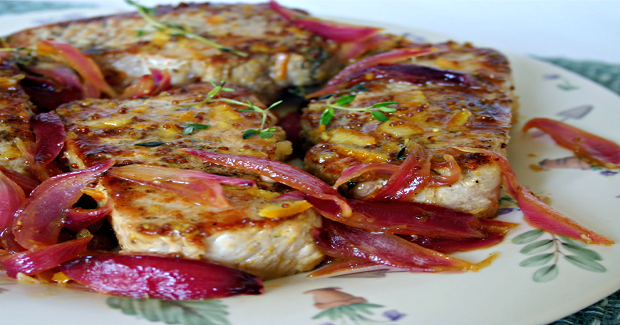 Orange-Mustard Glazed Pork Chops Recipe - Gutom Na! Posted on Wednesday, May 25th, 2016 at 11:55 am. Combine juice, marmalade, and mustard in a small saucepan over medium-high heat. Bring to a boil, reduce heat, and simmer 15 minutes or until syrupy. Heat a large ovenproof skillet over medium-high heat. Add oil; swirl to coat. Sprinkle pork with salt and pepper. Add to pan; cook 5 minutes or until browned. Turn pork; add rosemary and onion to pan. Pour juice mixture over pork. Bake at 425 degrees for 10 minutes or until a thermometer registers 140 degrees. Place onion and rosemary on a platter. Return pan to medium-high heat; add lime juice. Cook 4 minutes or until liquid is syrupy. Add pork to platter; drizzle with sauce.